Act IV of Cardboard Computer’s Kentucky Route Zero arrived by surprise last week. You may have heard people talking about this game in hushed, reverent tones. You may have seen it on our list of the best PC games, a rarified honor amid hundreds of worthy contenders. It’s just a simple point and click adventure game, right? Why do people like it so much? The episodic adventure game for PC, Mac, and Linux has been releasing in unpredictable spurts since 2013, with periodic free bonus content coming out in between. Plenty of people don’t like to play episodic games until they’re done, especially ones that are taking so long. But even with one act still to go, there’s more than enough to make Kentucky Route Zero worth it. It’s hard to talk about Act IV without talking about the acts leading up to it. Major plot threads and offhand mentions coalesce, resurface, and pay off in the latest installment. It’s clear the developers have a long arc in mind, and the story has grown and shifted since we first met Conway, an older man with a dog, puttering along in a broken-down truck. In Act I Conway is tasked with delivering an antiques shipment to 5 Dogwood Drive, and he stops at a place called Equus Oils for directions. From there, the game opens up into a mysterious, shifting highway—the eponymous Zero—and the cast expands as Conway gathers a small band of drifters around him. There’s Shannon, a TV repair person who lost family in a mine collapse; Ezra, an abandoned boy with a giant eagle for a brother whose house got turned into a museum; and Junebug and Johnny, two travelling musicians. Act IV introduces some new characters as well: the crew of The Mucky Mammoth, the boat that takes the cast along the Echo River as they all try to help Conway make his delivery. Kentucky Route Zero isn’t really about delivering antiques, but at the same time it’s about exactly that. It’s a game that’s deeply concerned with the nature of work: blue-collar jobs like mining that can be consolidated and replaced by machines; scamming and drifting to stay afloat; failing in the arts; and the self-absorbed impenetrability of academia. It’s a game that’s concerned about getting what you’re owed, finding out what you’re worth, and paying your dues. The question of dues and debt haunt Conway, and they come back in Act IV in terms of what he owes to the Hard Times Distillery, a sinister whiskey manufacturer with whom he became entangled at the end of Act III. The ‘boys from Hard Times,’ as they’re called, have always been one of my favorite things about the game since I first started to understand their nature through the free bonus release The Entertainment. The nature of debt is intimately related to the whiskey, made all the more resonant by my own take on Conway as an alcoholic. He’s got debts to pay, as everyone in the game does, but they aren’t just financial. In my hands he’s got the debt of the career drinker, the loss of self that can’t be paid back. In Act IV he continues to slip away even as his companions attempt to keep him around. Everyone in Act IV is losing themselves in one way or another—their jobs being replaced, their relationships changing, their family vanishing—but at the same time they’re planted in the earth, in history, for better or worse. A plaque at the bat sanctuary, for instance, harkens back to the mine collapse in Act I, the sad anger of working people refusing to be erased by big corporations that see them as disposable. It’s a theme that’s as at home in 2016 as it might have been in the 1930s. Things return, however much characters want them to stay buried, and at the same time the characters dive deep to dredge up the things they think they want to forget. At one point the characters visit a tiki bar, briefly mentioned in Act III, and Conway, unable to escape the pull of booze, says, “I can’t look at anything without remembering something else, and then that reminds me of something else, and—I’m buried in it. I just need to get my head clear for a minute, get a clear view of the day, get oriented…” The mining memorial is a way of getting oriented; a meal with friends after a great loss is a way of getting oriented; and even the truck and its ultimate goal of 5 Dogwood Drive, wherever that is, is a signpost by which the characters attempt to navigate the twisting, confusing thing that is their world. Even when you don’t quite know what’s going on, it’s hauntingly relatable. Kentucky Route Zero’s distinctive art style adds to this, portraying people and places vaguely but with an abundance of specific character. It’s easy to imagine yourself there, even if you can’t quite picture what these people look like or who they are; things feel both familiar and strange. The dialogue enhances this tension; while you make decisions like any adventure game, they often aren’t the ones you yourself might make. There are choices that don’t feel like choices or questions that seem impossible to answer. Sometimes it seems like the player is along for the ride rather than shaping the characters, but there’s still a deep sense of involvement in their lives. The dialogue is more like reacting as someone tells you a story, encouraging them more than deciding what they say next. Another one of Kentucky Route Zero’s most notable features is the appearance of a musical number in each act. Act IV’s music returns to the haunting bluegrass arrangements that Act III forewent for a rock song. The music has always been one of my favorite parts of the game, not just for being beautiful but because of what it says about God. 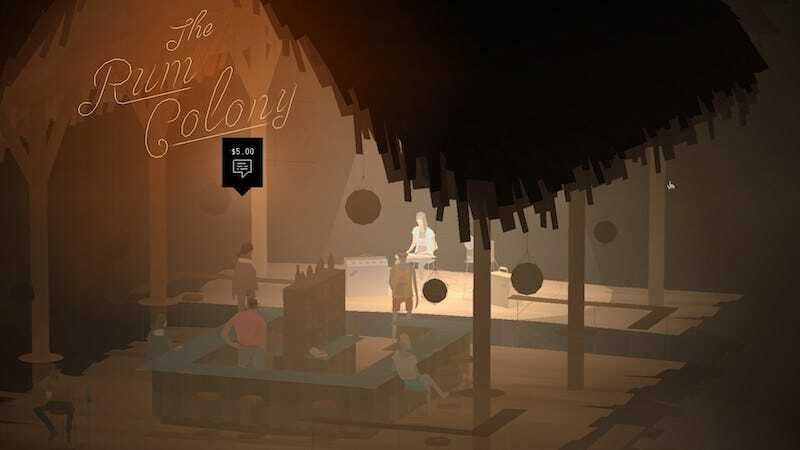 Kentucky Route Zero tends to exchange God for space—the recorded sermon in the warehouse in Act II, the distillery’s camouflage as a church in Act III. God is a presence, an escape, the same way work or alcoholism or change are, while also being inescapable, the same way work or alcoholism or change are. I’ve always found Kentucky Route Zero to be a deeply religious game, or a spiritual one, with the things it says about faith relatable whether or not you’re a religious person. Act IV features the song “This World is Not My Home,” a hymn from the early part of the 20th century, and its lyrics are both a comment on the events that unfold in Act IV and a comment on who God is in the world of the game: the longing to be done with things, to be somewhere else. The musicians from Acts I and II drift by to sing it—references within references, swirling and returning like currents. Of course Kentucky Route Zero is full of references: to the Southern gothic literary tradition and the work of writers like Flannery O’Connor and William Faulkner; to theater and set design; to video games like Colossal Cave Adventure; and to historical figures like cave explorer Floyd Collins and events like the Brookside miners’ strike. The developers have been open about their influences, and while at times the game risks becoming too enamored of them, it’s not necessary to have a degree in literature to appreciate them. It’s just one more way Kentucky Route Zero is rooted in time yet timeless, mixing the past and present to leave players unmoored in the best way. That heady mixture of past and present creeps outside of the game as well. I played Act III once when it first came out in 2014, but even two years later I was drawn back in as if no time had passed at all.